Hantavirus is caused by a virus that is primarily carried by deer mice. The virus is shed in the urine, saliva, and feces of infected mice. People may become infected by breathing in the dust of dried feces from mice nests or surfaces contaminated with mice droppings. Hantavirus Pulmonary Syndrome (HPS) begins one to six weeks after exposure to rodent feces. The early symptoms of HPS include fever, myalgia, nausea, vomiting, and diarrhea that persist from one to seven days before advancing to the cardiopulmonary phase of the illness. Hantavirus is not uncommon in Boulder County or Colorado. Deer mice are very common in rural areas throughout the U.S. Hantavirus is not spread from one person to another. Living in buildings infested with rodents. Cleaning barns, outbuildings, or grain storage areas. Working in confined spaces infested with rodents. Clearing shrubbery or doing hand-plowing. Open doors or windows to provide good ventilation for 30 to 60 minutes prior to cleaning. Spray droppings and nest material with disinfectant and allow to soak for 10 to 15 minutes before cleaning. DO NOT sweep or dry vacuum rodent droppings, as this will cause particles to go into the air where they can be breathed in. Use rubber gloves to pick up saturated waste, including nesting materials or dead mice. Use insect repellent (containing DEET) on clothing, shoes, and hands to reduce the risk of flea bites while picking up dead rodents. Clean up with a mop, sponge, or wet vacuum. Spray or wet clean carpets with a disinfectant. Clean bedding and clothing with hot, soapy water. Disinfect gloves before removing them, and thoroughly wash hands with soap and water. In cases of severe infestation, or when ventilation and dust suppression are not possible, use a rubber facemask equipped with a High Efficiency Particulate Air (HEPA) filter. 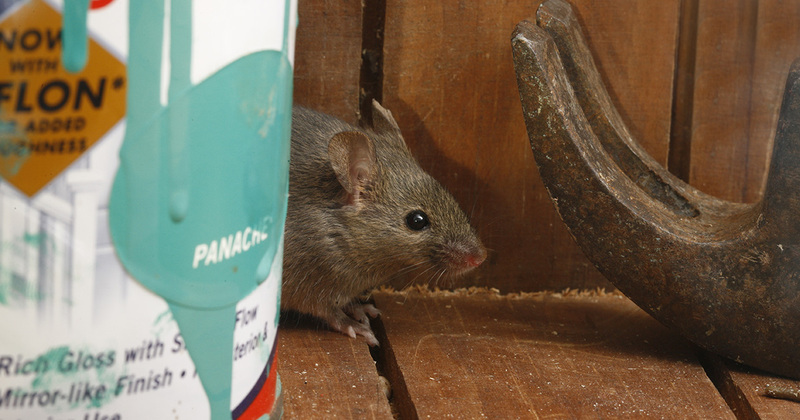 The best way to avoid hantavirus is to prevent contact with rodents. Seal any holes or openings larger than 1/4 inch to prevent mice from entering. Store all food and garbage in rodent-proof containers. Remove hiding places for rodents, such as wood, junk, and brush piles. Use rodent traps or poisons in problem areas on a year-round basis. When camping, avoid sleeping on bare ground. Instead, use tents with floors or cots.